Not sure if this is the right spot for this question, but what’s the best DS emulator to run through Retroarch on an Nvidia Shield? Which isn't through Retroarch, it's standalone. Drastic's good enough that there's people who'll run an Android emulator on their desktop just to use Drastic to emulate their DS collection. On my PC, I use all of the DS cores available depending on the game; I'd assume that depending on the game, you're not going to want to stick to just one core over the other. The SSAA 240p feature on Beetle PSX HW Vulkan is so neat, clever way to combat jaggies while still going with CRT shader. I still have issues with Vulkan renderer causing black streaking on my 4k TV unfortunately, same issue with Dolphin (and Doom 2016+Wolfenstein: TNO when playing at 4k). Is there a good Amiga emulator on retroarch? P-UAE seems to have issues, but I found another Amiga emu core but I have no idea how to instal it. The core itself doesn't appear among the list of downloadable cores from within retroarch. Does anyone here uses the latest nightly DeSmuME core? I booted up Dragon Quest IX on a whim last night, but it seems to ignore the chosen language both in the firmware and in the core settings. I have the EUR ROM. Instead of booting the game in English, it always boots in Spanish. - The language in the external BIOS/firmware is set to English, as well as in the core settings. - Loading the ROM in the standalone DeSmuME works fine, it correctly detects English as the chosen language. - I've tried using the generated firmware.dfc file from the standalone DeSmuME in RetroArch, but the core seems to ignore this file as well since it has no effect. I noticed that there was a Daphne core available in RetroArch and I have spent the last few nights trying to get this to work... Sadly there is ZERO documentation for this core and I have no clue how to get this working. The normal Daphne emulator seems so overly complicated for a old laserdisc game emulator, so I was wondering if anyone has any guides on how to get it working, as this would complete my setup for me. SSAA is a game changer for me, replayed and finished Silent Hill and Dino Crisis thanks to it. Using a shader with scanlines is a must for me when enabling it. I hope an N64 core will adopt this feature as well. This sounds wonderful! I've had pretty bad performance on the Beetle Saturn core, gonna try this out. Playing Resident Evil 1 with the Beetle HW emu and when I press Start to go into the menu, non of the textures or images load! Anyone know what causes this and what's a fix for it? Dunno. Tried switching to a different graphics API? Beetle HW PSX is broken (at least as of a month or two ago) with certain AMD cards and certain gfx apis. How do I do that? I am using an NVidia card...though I hadn't update it yet. I was using vulkan, gonna try dx11 at least. However vulkan is the api that uses the imrpvode rendering stuff doesn it? EDIT: Will try out both Vulkan and GPL. Man, Retroarch will be perfect once you can use different renderers for each core. Can't you already? Just make a few separate Retroarch directories, one for each renderer. Of course, but it'd be great to just have a per-core setting instead. Currently, I'm running my shortcuts with '--config retroarch_gl.cfg' or '--config retroarch_vk.cfg' which I admit I dislike. Ideally, I would love to be able just to set the 'video_driver' config per-core as Rufus has suggested, or per-game as mine preference, since I already made a bunch of it. Xbox One RetroArch Port for Early 2019! Dont you have to pay to enable dev mode? Hey so since there isn't a PCSX2 thread I'm asking here as it seems the closest. I want to play games at 1080p, but for some reason this isn't working as I remember it. It always shows the original resolution of the game on top of the window. But I remember it always used to show 1920x1080 instead..
Now the weird thing is I looked it up and every answer to this problem says "that's normal it always shows the original resolution on top of the window"
Well, except it doesn't, or at least didn’t use to do that? I've already set it to 4x resolution but that doesn't solve the problem (and I ticked on wide-screen hacks too) no matter what I try it always displays the original resolution, and I don't think that's right, as games appear to be really blurry. kageroo , the resolution shown in the PCSX2 window title bar is the internal resolution as set in the Gsdx settings. If you want to start the game in 1080p (as in your monitor's native resolution, I assume), simply check the "default to fullscreen mode" option under the Config > Emulation Settings > GS Window. Alternatively, if you prefer to play in 1080p windowed mode, you can set a custom window size (1920x1080) under GS Window options as well, and leave the "default to fullscreen mode" option unchecked. A third alternative is to set a custom resolution under Gsdx settings (1920x1080). Although, I can't recommend doing this since you'll lose the benefit of antialiasing when downsampling from a higher internal resolution as far as your graphics card can possibly allow. "Alternatively, if you prefer to play in 1080p windowed mode, you can set a custom window size (1920x1080) under GS Window options as well, and leave the "default to fullscreen mode" option unchecked." Could also be the version I'm using (1.4)? It could be. The stable 1.4 from the PCSX2 website should be pretty old by now. I'd recommend getting the Nightly version instead since it contains a lot of improvements. Is anyone familiar with how to set an "Insert Coin" button with Retroarch on Android devices? I'm using a PS3 controller on my Shield TV, and I've read that for MAME, the select button is supposed to be the default for inserting coins. It doesn't seem to be working for me, and I can't find anywhere in the input menus to set that functionality. Another problem is I'm not sure what to do about select being the default back button for the Retroarch UI and if any games actually use the select button. Other games I tried work just fine though. Yeah, PCSX2 has had that framepacing issues for as long as I can remember. Sometimes the OGL renderer works better than its DirectX counterpart though, but it varies from one game to another. Ah I see that's what it is, I thought I was going crazy haha. Oh well, I'll try OGL, but maybe there's another emulator I could try? Well, there is Play! , but it's nowhere near enough maturity in terms of games compatibility to even consider switching from PCSX2. If you have an Nvidia GPU, you'll definitely see a bit of improvement when using the OGL renderer. I hardly use the DirectX renderer myself. Does anyone have any suggestions on how to setup the video settings for aspect ratio with integer scaling for Genesis emulation without cutting off the top of the screen in 1080p? When emulating SNES I'm able to find an integer multiplier that looks to be about right aspect ratio wise, but only cuts off modestly on the top and bottom, apparently only in traditional overscan area. However, trying to do the same when emulating Genesis games ends up with some actual UI elements (for example text in the Castlevania bloodlines being cut off at the top) being offscreen, and the screen looking a bit too narrow (skinny sprites). Using the core aspect ratio looks ok, but is windowed in the middle of the screen which I like to avoid. Might I be stuck having to use non-integer scaling on Genesis? Not a terrible solution, just occasionally makes the CRT shader I like to use look wonky. Which of the CRT filters works properly with non-integer scaling? I've tended to stick to Easymode or Hyllian with halation, except for SNES where I use the Royale preset that has the Themaister S-video NTSC shader built in? I wish there was built in READMEs for all the shaders (unless there is and I've just never noticed). Besides the Easymode shaders, the new crt-guest-dr-venom preset looks even to me at non-integer. 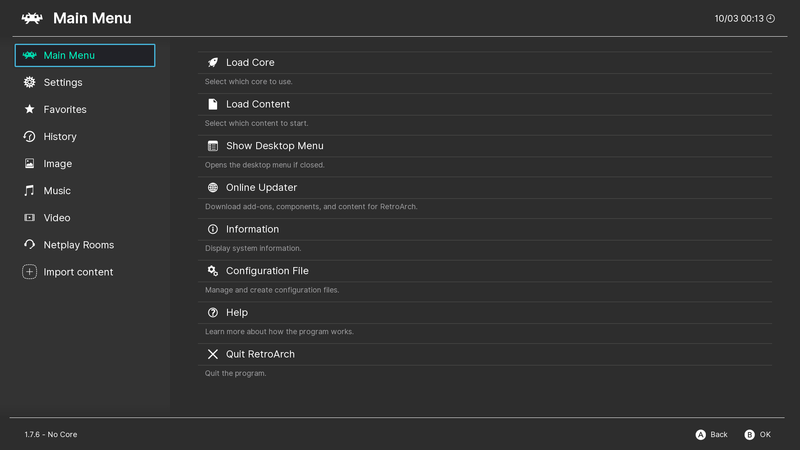 New article: RetroArch 1.7.6 – Released! So whoch emulators can one use that esrgan ai scsler with? Any emulator that allows you to load custom textures, though it doesn't mean the libretro cores support it as well. You'll have to Google each you intend to use. "RetroArch in its full-fat form would not be possible to be published on the Microsoft Store given all the console emulators. A neutered version bereft of all its emulators might be possible to be published, but it’s debatable how many people would be truly interested in that right now. So, Developer Mode is the best compromise/alternative for now." So does this mean that they could actual release RA with just the homebrew cores intact and leave the door open for the end user to add there own cores via USB and the core update option or the like, i mean they wouldnt be breaking any terms or conditions on emulators as there not including any? What's the go to MAME/Arcade emulator on RetroArch? There is one that is just MAME, is this the main one that gets updated? Mame without a year after it is (or should be) the most recent version, yes. It seems that the screenshot function in v1.7.6 is still resulting in crash to desktop when Vulkan renderer is used. Has anyone here encountered the same issue? I'm fairly new to setting up Retroarch and have been messing with shaders. On my Android phone, the shaders seem to be working fine. Scanlines display horizontally. On my PC, the same shader is displaying the scanlines vertically. I have to apply a vertical shader to get horizontal lines on my PC. Does anyone have any experience/insight into properly calibrating brightness and contrast with the 240p test suit using the pluge pattern? I'm confused about the color spaces as I'm trying to use it to get a VGA monitor adjusted and I'm not sure if I'm doing it right or not. I first noticed that it's the default one on Switch RA. You can select it on the PC version by doing to Driver>Menu>Ozone. Then restart.